Wildly complex with aromas from roasted nuts to eastern spices, this is a liquid elixir that can rock anybody's world. 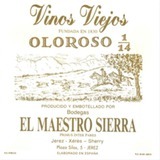 The age of this solera here is very hard to determine as the wines have been here for as long as one can remember. The 14 butts of this wine have spent at least 50 years in the solera system.